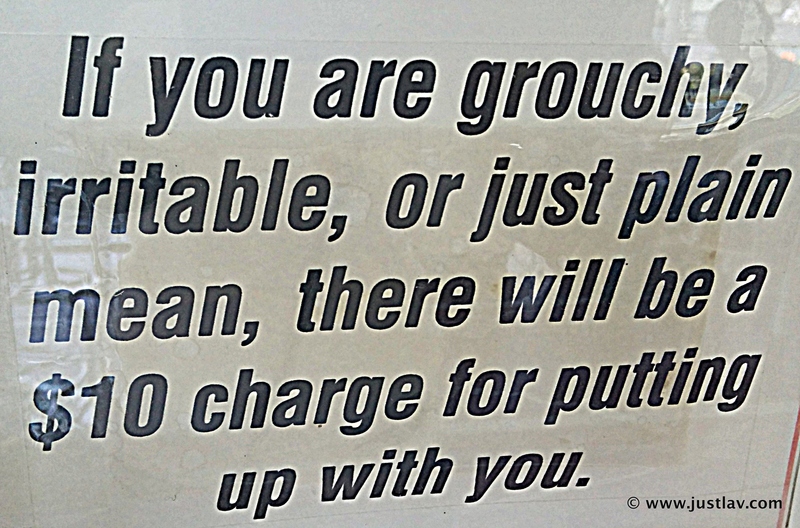 While on a quick lunch break this weekend at a local old-school diner, I saw the following sign: “If you are grouchy or irritable or just plain mean, there will be a $10 charge for putting up with you.” In fact, the entire place was filled with little announcements about how being a not-so-nice person will only work against you. After a more than pleasant experience there during which we happen to receive lollipops as a result of just being nice people, I started thinking about the importance of treating other people with respect and what that says about one as a person. This particular place actually put a price on grouchiness and meanness, but most of the times in life, the price is not as obvious. We don’t know what we lose by treating people badly until we have already lost that opportunity and everything it brought with it. Granted sometimes we don’t really lose anything, or better said we lose nothing of value to us, but other time we can lose everything, just because of our attitude. If you’re a genuinely good person, you will never treat people badly even when they try to treat you that way. You will simply remove yourself from the situation or find respectful ways to deal with it. However if you do catch yourself treating other people badly, just remind yourself that at the end of the day, the way you act is a direct reflection on you not on them. What do you want that reflection to be? ← Are We Denying Our Simple Pleasures?